LIMA, Peru (CNN) -- President Bush, in what could be his final overseas trip as president, called on international leaders Saturday to continue his administration's push for free trade despite the global financial crisis. President Bush briefed world leaders on his G-20 economic summit Saturday at the APEC meeting in Peru. "One of the enduring lessons of the Great Depression is that global protectionism is a path to global economic ruin," Bush told the annual meeting of the 21-nation Asia-Pacific Economic Cooperation forum in the capital, Lima. "I recognize I'm leaving office in two months," Bush said as he discussed the Doha trade talks, which were launched in 2001 to help liberalize international trade policies, "but nevertheless, this administration will push hard ... so that Doha can be completed and so we can send a message: We refuse to accept protectionism in the 21st century." Touting his record on free trade, Bush said, "expanding trade and investment has been one of the highest priorities of my administration. "When I took office, America had free trade agreements in force with only three nations. Today, we have agreements in force with 14." Among APEC member nations, he cited Chile and Peru as more than doubling their trade with the United States during his time in office, and trade with China more than tripling. 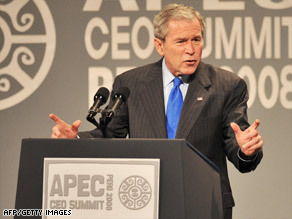 "Overall, America's trade with APEC nations now accounts for nearly two-thirds of our trade in the world," Bush said. Bush chided the U.S. Congress, saying it was "extremely disappointing" that lawmakers adjourned without passing new trade agreements between the United States and Colombia, Panama and South Korea. "I urge all those who support free trade to continue to press the case for the Congress to pass free-trade agreements with Colombia and Panama and South Korea," he said, drawing applause from his audience. Referring to the global financial crisis, Bush said, "recovering from the financial crisis is going to take time. But we'll recover and, in so doing, begin a new era of prosperity. The nations of APEC have faced tests before. We have risen to meet them together, and we will do so again." After his speech, Bush met briefly with Russian President Dmitry Medvedev. Russia is a member of APEC. "This will be my last meeting as the sitting president with the leader of Russia," Bush said after the two leaders shook hands. "We've had our agreements; we've had our disagreements. I've tried to work hard to make it a cordial relationship, though, so that when we need to work together, we can, and when we disagree, we're able to do so in a way that is respectful to our two nations," Bush said. Medvedev, speaking through an interpreter, responded by saying, "In general, though we do have points of agreement and those points of real differences ... we are prepared for the continuous work, and I view that, in general, our work was successful." Bush's attendance at the APEC meeting marked his eighth year of meeting with and speaking to economic leaders from a diverse group of countries ranging from Thailand to Mexico, Chile to China. Bush came to the APEC meeting seeking to build on the results of a historic two-day meeting in Washington this month attended by presidents and prime ministers from 20 countries. At that meeting, world leaders unveiled a set of sweeping plans aimed at tackling the ever-expanding economic crisis, which has roiled financial markets worldwide. The final 3,600-word announcement from that Group of 20 meeting in Washington endorsed several stimulative measures, including interest rate cuts by central banks around the globe or potential economic stimulus packages. Leaders who met in Washington also agreed not to raise new trade barriers over the next 12 months and vowed to reach a resolution on the Doha trade talks. Bush gave the APEC leaders a briefing on the Washington meeting, according to Dan Price, assistant to the president for international economic affairs, and the leaders discussed the issues of the global economic crisis, the Doha trade talks and food aid. On food issues, Bush noted that the United States has budgeted $5.5 billion in food aid for this year and next, Price said. Price said that all of the other APEC leaders endorsed the measures discussed by the Group of 20 meeting in Washington.